The 10 Best State Parks in North Dakota! Nowhere is the beauty of North Dakota more present than its state parks. The park system gives visitors a first-hand look at North Dakota’s history, cultural significance, native vegetation, and animal population. A variety of fishing, hiking, and exploring opportunities abound throughout the parks. Here are the 10 best! Located on the southern shore of beautiful Lake Sakakawea, the 1,293-acre park is home to some of the state’s best salmon fishing. The lake itself is one of the three largest man-made structures in the country, trailing only Nevada’s Hoover Damn and Arizona’s Glen Canyon Dam. The park is also the culmination of the North Country National Scenic Trail, which stretches across the northern U.S. to upstate New York. Lake Sakakawea State Park is home to campgrounds, sleeping cabins, a full-service marina, a swim beach, picnic shelters, and a fully-functional RV dump station. Located on the tranquil Turtle River, the 784-acre park provides year-round recreational activities for the eastern part of the state. With an abundance of rainbow trout, the river offers prime fishing opportunities in all four seasons. A groomed trail system affords up-close looks at the wide variety of animals and birds in the area, and the wetlands are flush with natural vegetation. Turtle River State Park also includes campgrounds, picnic shelters, a playground, a sledding hill, and a RV dump station. 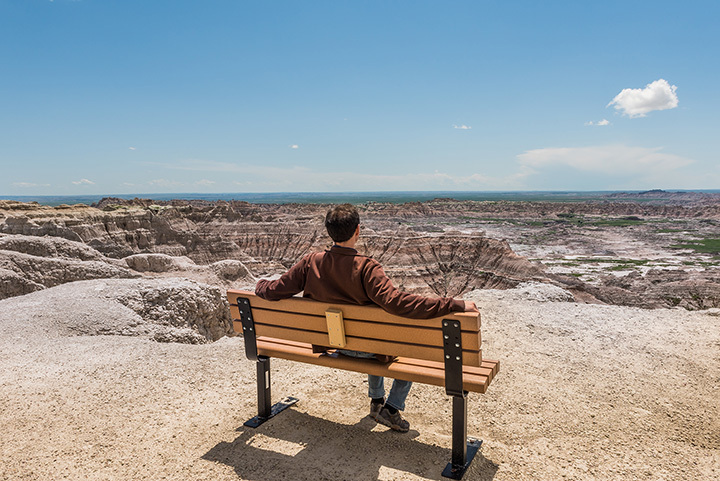 Located on one of the upper bays of Lake Sakakawea, Lewis & Clark State Park provides visitors with an unparalleled view of the famous North Dakota Badlands. Few places in the state can boast such a serene and breathtaking combination of land and water. Famous for its excellent walleye and northern pike fishing, the park is also known for its washed sand beaches and excellent hiking trails. The 490-acre Lewis & Clark State Park also includes campgrounds, sleeping cabins, a full-service marina, a boat ramp, picnic shelters, and a fully-functional RV dump station. For history buffs, the 1,006-acre Fort Abraham Lincoln State Park is for you. From this fort, Lt. Col. George Armstrong Custer along with the Seventh Cavalry, rode out on what was a deadly expedition against the Sioux at Little Big Horn. Parts of the military post, including the Custer House, have been rebuilt. The park is also home to the On-A-Slant Indian Village, which includes the reconstructed earth lodges of the 16th century Mandan Indians. In addition, Fort Abraham Lincoln State Park includes 6.75 miles of groomed trails, campgrounds, picnic shelters, a visitor’s center, RV dump station, and horse corals. Located in the scenic Sheyenne River Valley, the 950-acre Fort Ransom State Park is known for its canoeing and kayaking opportunities in the summer and cross-country skiing and snowmobiling trails in the winter. The 14.64-mile trail system is also a popular destination for summer hikers. The park includes a campground, RV dump station, picnic shelters, a playground, and several historical building and interpretive opportunities. Located three miles south of the park is the original Fort Ransom, which was established in 1867 to guard the trail from Fort Abercrombie to the Missouri River. The 589-acre Cross Ranch State Park is located along the gorgeous Missouri River, and it has been purposely left primitive to protect the land’s natural beauty. A popular location for walleye, bass, and pike fishing, the park is also known for its canoeing and kayaking potential. With a trail system that extends over 16 miles combined with the adjacent 6,000-acre Cross Ranch Nature Preserve, hikers and nature enthusiasts can enjoy one of the richest and most authentic locations in the state. The north shore of Lake Sakakawea is home to another great park in Fort Stevenson. Known as the walleye capital of North Dakota, the park is home to many fishing tournaments, including the Governor’s Cup Walleye Fishing Derby. The 549-acre park includes a campground, visitor center, boat ramp, arboretum, prairie dog town, an RV dump station, two marinas, and an 8.13-mile groomed, multi-use trail system. Boats, pontoons, bikes, canoes, paddleboats, and kayaks are available for rental. Located on North Dakota’s largest lake, the 1,122-acre park is home to some of the state’s best fishing during all four seasons. A popular hiking, snow shoeing, and cross-country skiing location, the park offers a wide variety of activities that take advantage of all North Dakota has to offer. Graham’s Island also features a campground, RV dump station, activity center, boat ramp, bait shop, picnic shelters, and a playground. Located on the north shore of Lake Renwick, the 912-acre park is home to the Pioneer Heritage Center, restored historic buildings, the Gunlogson Homestead, and a 200-acre Nature Preserve. The natural wooded area along the Tongue River is a sanctuary for the plants, birds, and wildlife that depict the natural beauty of the state. Boating, swimming, and fishing opportunities abound in the summer, while hiking, snowshoeing, and cross-country skiing are popular in the winter. The park also includes a campground, RV dump station, visitor’s center, boat ramp, fishing dock, groomed beach, picnic shelters, and a playground. Located within the magnificent Turtle Mountains on the shores of Lake Metigoshe, this 1,551-acre park is a hot spot among nature and photography fans. The Chippewa named the lake “Metigoshe Washegum” which translates to “clear water lake surrounded by oaks.” Anglers flock from all over to try their hand at catching northern pike and walleye. Hikers are drawn to the park’s Old Oak Trail and National Recreation Trail. The park also features a campground, RV dump station, kitchen, boat ramp, canoe, kayak, ski, and snowshoe rentals. View more North Dakota Parks.